Taylor, P. Pink Floyd: The Black Strat - A History of David Gilmour's Black Fender Stratocaster, London, 2017, illus. p. 68. 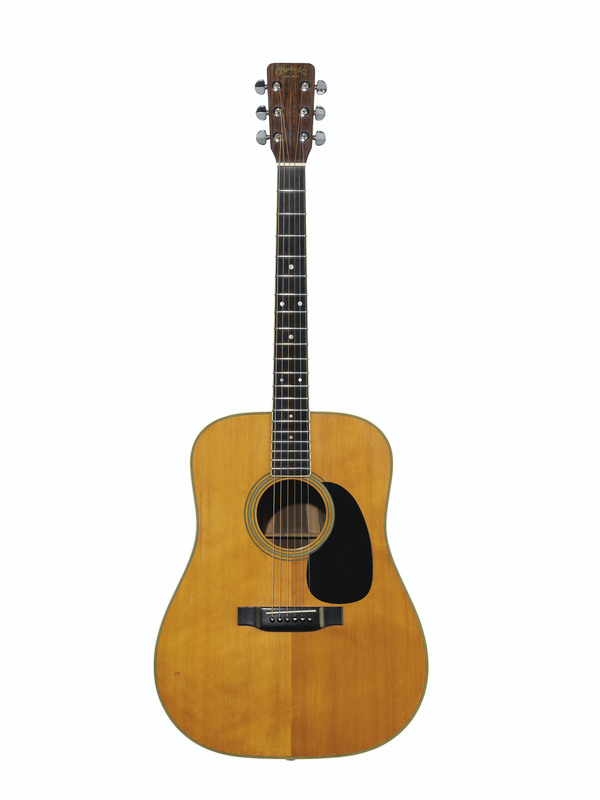 Often cited as David Gilmour’s favorite guitar, his Martin D-35 stands out as the most significant acoustic in the collection and, it could be argued, one of the most important guitars in the collection as a whole. Purchased circa 1971 from a musician who was hawking his guitar on the street outside the famed Manny’s Music on Manhattan’s West 48th Street, where Gilmour had purchased his Black Strat only the year before, the D-35 has served as the primary studio acoustic for both Pink Floyd and Gilmour’s solo recordings since late 1971. Asked by Guitar Player magazine in 2003 which of his guitars has the most songs attached to it, Gilmour replied I guess it would be my Martin D-35. I used it on Wish You Were Here, and I've been using it ever since. Although used during writing and pre-production for The Dark Side of the Moon in London from November 1971, the guitar was first seen in the recording studio during sessions for the 1972 soundtrack album Obscured by Clouds. Following their successful soundtrack to Barbet Schroeder’s More in 1969, Schroeder asked Pink Floyd to compose an atmospheric soundtrack to his new movie La Vallée. Unusually for the band, the music was written and recorded over an intensive two-week period at Michel Magne's Chateau d’Hérouville studios near Paris between February and March 1972. Numerous studio photographs taken by Jean-Denis Mahn documented the sessions, many of which were featured on the CD/DVD/Blu-ray package The Early Years 1972 Obfusc/ation, and clearly show the Martin D-35 as a key instrument in the development of the album, with both David Gilmour and Roger Waters writing and recording on the guitar. On the final record, the acoustic can be heard on the tracks Wot’s… Uh The Deal, Childhood’s End and Free Four. Although somewhat eclipsed by the soon to be released The Dark Side of the Moon, Obscured by Clouds has been hailed as some of Pink Floyd’s best work, and certainly one of their most truly collaborative efforts. Gilmour confirms that the guitar was present for writing purposes during the recording sessions for the band’s 1973 masterpiece The Dark Side of the Moon at London’s Abbey Road Studios between May 1972 and January 1973, although no acoustic parts were recorded for the final record. The D-35 has become most readily identified with the acoustic title track of Pink Floyd’s next studio album Wish You Were Here, another concept album, built around the theme of absence, and a worthy successor to the now legendary The Dark Side of the Moon. Recorded intermittently between January and July 1975 at London’s Abbey Road Studios, the acoustic can be heard on the track Welcome To The Machine, as well as the timeless Wish You Were Here, hailed by Rolling Stone as the band’s most enduring composition. After playing the famous intro and instrumental passages on his twelve string Martin D12-28 (lot 11), Gilmour performs the song’s acoustic solos on the D-35 and accompanies himself on lead vocals. Often considered a tribute to founder member Syd Barrett, Gilmour admitted in the 2012 documentary The Story of Wish You Were Here that he never plays the song without remembering Barrett. Gilmour’s attachment to this guitar reflects his affection for the song and album on which it played such a key role –Wish You Were Here is cited as Gilmour’s favorite Pink Floyd album, and the title track has become an absolute staple of his live repertoire. In The Story of Wish You Were Here, Gilmour mused that …because of its resonance and the emotional weight it carries, it is one of our best songs. Along with the band’s newly acquired Ovation Custom Legends, the D-35 remained indispensable during recording sessions for the 1977 Pink Floyd album Animals at their Britannia Row studio in North London between October and December 1976. Gilmour recalled I was still using the D35 in the studio while we were using the Ovations… I’m pretty sure I used the D-35 on Dogs on that album. As such an instrumental studio guitar, Gilmour deemed the D-35 too precious to modify for touring purposes, explaining it was bought to play on tour, but it hasn’t been out much lately. When we started and when I first used this guitar, we would use it on very quiet songs which didn’t have electric backing so you could actually sit on a stool and have a microphone on the guitar and a microphone for your voice and you could achieve that. Of course, as soon as you’ve got the drums and the bass playing, that gets very, very much harder and you have to start converting instruments to have pickups of some sort. And some of these ones, you just don’t want to muck about with them, you don’t want to start digging away inside them and building pick-ups into these guitars. Instead, the band began to rely on Ovations for touring due to their built-in electronics and sturdiness. With its originality intact, the D-35 was back in action when Pink Floyd headed to Super Bear Studios in the South of France in April 1979 for the recording of their eleventh studio album The Wall, moving to Producer’s Workshop in Los Angeles from September-November 1979. Gilmour played acoustic parts on the Martin for the tracks Mother and The Show Must Go On. The guitar was subsequently used for the majority of the acoustic recordings on Gilmour’s 1984 solo album About Face, after which the D-35 contributed some acoustic licks to the song Terminal Frost on Pink Floyd’s 1987 album A Momentary Lapse of Reason. Although a Gibson J-200 Celebrity was also utilized on the band’s 1994 album The Division Bell, studio footage of Gilmour playing the D-35 on board the Astoria in 1993, alongside band mates Nick Mason and Richard Wright, affirms that the guitar remained vital to the writing and recording of the album. In 2003, Gilmour recorded an acoustic version of Breathe on the D-35 at his Astoria houseboat studio for the Eagle Rock documentary Classic Albums: The Making of The Dark Side of the Moon. When returning to the studio in 2005 to record his first solo album in 22 years, Gilmour turned to the Martin D-35 once again. When asked which acoustic guitars featured on his 2006 album, On An Island, Gilmour told Guitarist magazine There’s a D-35 I’ve had for a very long time, which I played on Wish You Were Here. That’s the same guitar I’m using on some of these tracks. It’s great for strumming. Photographs taken by author and lyricist Polly Samson captured Gilmour strumming the guitar at Abbey Road Studios on 26th March 2005. Gilmour continued to use the D-35 during recording of his 2015 solo album, Rattle That Lock, telling Guitar Player magazine in October 2015: I’m still using two different Martin guitars for my acoustic stuff, one of which is the same D-35 guitar that I used to record Wish You Were Here. As new guitar parts for the final Pink Floyd album The Endless River were recorded simultaneously with Rattle That Lock from 2013-2014, one could surmise that the D-35 would likely have been used during these sessions also. A faithful companion throughout his incredible writing and recording history, Gilmour’s attachment to the guitar is clear. In April 2003, when asked by Sue Lawley on the long running BBC4 Radio 4 show Desert Island Discs what his luxury ‘desert island’ item would be, Gilmour responded: Well to me it’s not a luxury, it’s an essential. I need to take my guitar with me, my acoustic Martin D-35 guitar, because life is impossible without a guitar. The 186 year history of Martin Guitars begins in Markneukirchen, Germany with the birth of Christian Frederick Martin in 1796. Born into a family of guitar and cabinetmakers Christian Frederick was sent to Vienna at age 15 to apprentice with celebrated luthier Johann Stauffer. Upon returning to his native Saxon he found himself embroiled in a bitter dispute between two competing Guilds. The Cabinet Makers Guild who were the traditional makers of guitars in Germany were being challenged by the powerful Violinmakers Guild for the right to produce guitars. Though successful in defending his right to make guitars, Christian Frederick felt that the restrictive guild system bridled his opportunities and creative process in Germany. In 1833 he emigrated to the United States and set up his first workshop on Hudson Street in New York’s Lower West Side. Here he plied his trade for five years before moving his family and business to the pastoral setting of Nazareth, Pennsylvania. The rolling hills of the Pennsylvania countryside must have suited Martin, for it was here in the 1850s, unfettered by the German Guilds, that he was fully able to express his artisanship. The most enduring contribution to the luthier’s art came about at this period with his innovation of the “X” bracing pattern for the top of a guitar. This bracing system is responsible for the extraordinary tonal quality of Martin instruments. This system proved to be the perfect balance of mass and material allowing the top to vibrate to its fullest potential. It later proved to be integral with the use of steel strings on guitars allowing the top to withstand the pressures they exert. It would be embraced by the majority of guitar makers a century later, making the steel string guitar the choice for musicians of popular song. Through the 150 plus years and seven generations of Martin Family leadership this American guitar company produced a range of models and styles that became the standard for all flattop guitar design. Their work influenced a generation of American Post War makers in both design and construction techniques. These instruments gave an indelible voice to all genres of music including rock and roll. As early as 1917 the C.F. Martin Company was producing “extra-large” bodied guitars for the Boston publishing house of Oliver Ditson, which were sold bearing the Ditson name. They came in three styles: the 111, 222, and 333. Christened the Dreadnought, it got its name from the class of large battleships deployed by the British Navy at the beginning of the 20th Century. These first Dreadnought guitars, constructed by Martin, were made with mahogany back and sides, similar to today's Style 18s, and fitted with a 12-fret neck. After Ditson's demise in 1931, Martin began producing D-series guitars under their own name, in response to musicians' demands for louder instruments. It is believed that two experimental D-1s of mahogany and seven D-2’s of rosewood were made that year before committing to the formal model designation of the D-18 and D-28 we know today. C.F. Martin and Company records show that on 17th September 1931 a Shop Order, number 1100, was processed and work began on two guitars - serial number 48324, a D-18, and serial number 48325, a D-28. This instrument would be the first Martin guitar manufactured officially as a D-28 and the only one made in 1931. Four would be produced in 1932, twelve in 1933 and twenty-four in 1934, before the market would favor the 14-fret models. The Dreadnought became an almost instant success among performing guitarists despite some reservations by Frederick and Frank Henry Martin. During the height of the Depression it would outsell all other models made by The Martin Company, except for the budget priced O-17. The fact that a majority of guitar makers employ a Dreadnought model to this day is a testament to its success as an outline in acoustic guitar design. By 1965 C.F. Martin had experienced a 32% increase in production totals in just five years, a growth pattern that would continue over the next eight years. Among the model line of guitars produced by Martin, it was the demand from customers and orders for the Dreadnought models that drove this growth. These instruments required rosewood logs wide enough to mill-out the traditional two-piece backs used on the big bodied D models. With a diminishing resource of old growth Brazilian Rosewood, Frank Herbert Martin understood the biggest threat would soon be sourcing the materials to fill the growing orders. The answer came from a new employee at C.F. Martin, named Bob Johnson. He suggested that Dreadnought guitars could be made with three narrower billets of rosewood joined to make the width required for the back and thus was born the model D-35. The seasoned luthiers in the Martin workshop understood that a three-piece back would be stiffer than a two-piece and could adversely affect the tonal quality Martin guitars were relished for. 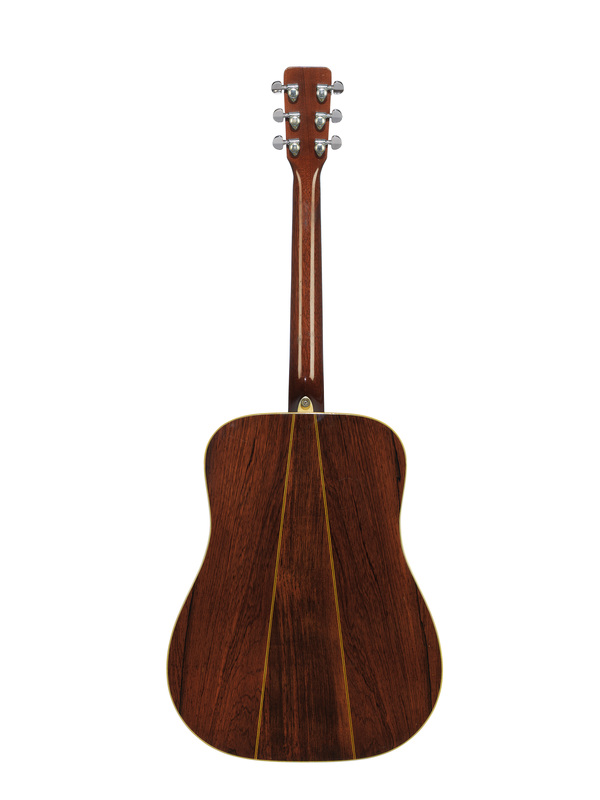 Through a considerable amount of experimentation, the luthiers compensated for the stiffer back with alterations to thicknesses and bracing; by incorporating the bracing pattern and dimensions for the smaller OOO size guitars on the back of the D-35, and yet smaller bracing from an OO for the new model’s top, they solved the potential problem. The result was a distinctly new sounding Dreadnought guitar that was quickly embraced by players. The D-35 was so well received that it began to outsell the D-28, which was C.F. Martin’s most popular model at the time.